as well as some past players returning after extended absence from the game. about 20+ players per night, with the largest crowds on Sundays. More tables will soon be added to reduce down time. Congratulations to Subhajit Maitra . New England Fall Classic in Waltham, Mass. Middletown club for a few monthes a few years ago. players and reluctantly returned to playing Racquetball. club's recent growth and added playing night. 'We (Middletown) now have the best club to play at in the New England area'. Sunday nights recently in Middletown. without ever having to play anyone twice - unless you want to. Typical recent attendance in Fairfield has been 12 to 16 players. notify interested players has affected the timing or feasability of them. interest (if any) in local tournaments, coaching, ratings etc are also welcomed. Help us spread the word about TT in YOUR world ! Copies are usually availlable from Dave at the club too. T-shirts are affordable ways to attract new players. not print with the correct size or margins directly from the internet. of New Jersey in the finals. 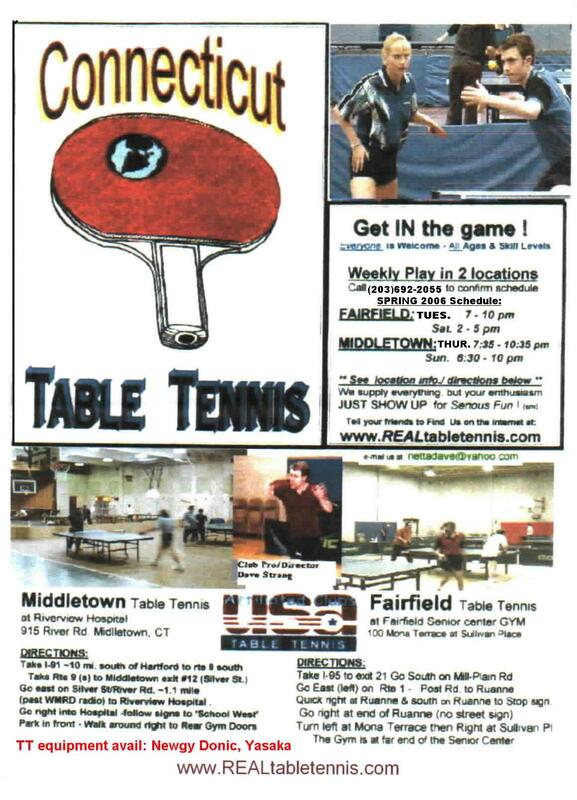 the September tournament at the Stiga World TT Club in New Jersey. He reached the finals with an upset over US Women's Olympian Lily Yip. New Jersey champion Barry Dattel and her friend David Fernandez. qualifying events to earn this credential. Middletown in the last few monthes. Westport have joined us this summer. world class style serves and backhand loops in Middletown. a doctor doing training in area hospitals. early July in Palm Beach FL. winning the Senior Men's (40+) Doubles events with Texan Kieth Evans. US #1 ChengYengHua - one of the team he beat in doubles previously. He also reached the quarterfinals of the under 2350 rated singles event. Seniors over 30 losing to former US Champ Jimmy Butler in 3 games. Val Ort (Fairfield TTC) reached a semifinal in the u4200 doubles event. rating points but didn't reach any finals. takes you to the ITTF Pro Tour results. and I will try to keep this going by minimizing any summer cancelations. This new web address should be easy to remember and share with others. Greg plays at both Fairfield and Middletown. under 1975 title at this major tournament held near Albany N.Y.
and winning a match against a near 2300 player in another event. Championships, has returned to the Nutmeg state in late March. and has returned to Hamden and club play in Fairfield. the top 20 women players in the USA during 1999-2000.
play during the Superbowl Football game. and Val Ort from Darien. attract a respectable 10 players, with 12 players the following week. including former members of the Jamaican and Phillipine TT Teams. both the Under 800 and Under 1000 events . Greg plays in Fairfield, and occasionally in Middletown. He is a relative newcommer to both the club and the tournament scene. will ALSO play in Middletown on Wednesday nights at 7:35pm. Please come out ASAP to show you support midweek play in Middletown. help us start the new night with a bang. if players arrive at 6:30 and ask for an earlier start. or confirm your contact information to my e-mail list. which TT news 'alert' e-mails would be of likely interest to you. helpful, particularly if you aren't on the USATT membership lists. 'advertise' new playing times, programs or events. friends curious about your TT 'addiction'. the article also includes quotes from a prominent NYC cardiologist who plays. Club director Dave's personal phone number has changed. Calls can reach my cellular phone at (860)922-8578.
weekly (rather than daily) so call if you need info quickly. calling the club schedule number at (860) 586-7055.
severe weather or other emergencies (power failure etc). so please don't call my cell phone for that purpose.